The following is the full text of a speech which was given by Seneca Chief Sagoyewatha, who was born around 1757 and died in 1830 in Buffalo, New York. He was later re-interred, despite his wish that "no white man dig me up for re-burial." 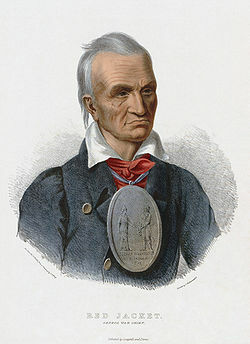 His nickname of Red Jacket came from his alliance with the British against the Colonists during the American Revolution, during which time he took to wearing the coat of a British Officer. This speech was made before a Council of Confederated Chiefs after they had heard from a white missionary who had arrived and begun to preach to the Natives. I had never heard this speech before, I ran across it in the library today. There is a whole wealth of information about Red Jacket on-line. Wikipedia is always a good place to start, so here's a link to that, followed by the full text of the speech itself. It is majestic. Friend and Brother, It was the will of the Great Spirit that we should meet together this day. He orders all things and has given us a fine day for our council. He has taken his garment from before the sun, and caused it to shine with brightness upon us. Our eyes are opened, that we see clearly; our ears are unstopped, that we have been able to hear distinctly the words you have spoken. For all these favors we thank the Great Spirit; and him only. Brother, This council fire was kindled by you. It was at your request that we came together at this time. We have listened with attention to what you have said. You requested us to speak our minds freely. This gives us great joy; for we now consider that we stand upright before you, and can speak what we think. All have heard your voice, and all speak to you now as one man. Our minds are agreed. Brother, Listen to what we say. There was a time when our forefathers owned this great island. Their seats extended from the rising to the setting of the sun. The Great Spirit had made for the use of the Indians. He had created the buffalo, the deer, and other animals for food. He'd made the bear and the deer, and their skins served us for clothing. He had scattered them over the country, and had taught us how to take them. He had caused the earth to produce corn for bread. All this He had done for his red children, because He loved them. If we had any disputes about hunting grounds, they were generally settled without the shedding of much blood. But an evil day came upon us. Your forefathers crossed the great waters and landed on this island. Their numbers were small. They found friends and not enemies. They told us they had fled from their own country for fear of wicked men, and had come here to enjoy their religion. *They asked for a small seat. * We took pity on them, granted their request, and they sat down amongst us. We gave them corn and meat; they gave us poison in return. The white people had now found our country. Tidings were carried back, and more came amongst us. Yet we did not fear them. We took them to be friends. They called us brothers. We believed them, and gave them a large seat. At length their numbers had greatly increased. They wanted more land; they wanted our country. Our eyes were opened, and our minds became uneasy. Wars took place. Indians were hired to fight against Indians, and many of our people were destroyed. They also brought strong liquors among us. It was strong and powerful and has slain thousands. Brother, Our seats were once large, and yours very small. You have now become a great people, and we have scarcely a place left to spread our blankets. You have got our country, but you are not satisfied; you want to force your religion upon us. Brother, Continue to listen. You say that you are sent to instruct us how to worship the Great Spirit agreeable to His mind. And if we do not take hold of the religion which you white people teach, we shall be unhappy hereafter. You say that you are right, and we are lost. How do you know this to be true? We understand that your religion is written in a book. If it was intended for us as well as for you, why has not the Great Spirit given it to us, and not only to us, but why did He not give to our forefathers knowledge of that book, with the means of understanding it rightly? We only know what you tell us about it. How shall we know when to believe, being so often deceived by the white man? Brother, You say there is but one way to worship and serve the Great Spirit. If there is but one religion, why do you white people differ so much about it? Why not all agree, as you can all read the book? Brother, We do not understand these things. We are told that your religion was given to your forefathers and has been handed down -- father to son. We also have a religion, which was given to our forefathers, and has been handed down to us, their children. We worship that way. It teaches us to be thankful for all the favors we receive; to love each other, and to be united. We never quarrel about religion. Brother, the Great Spirit has made us all, but He has made a great difference between his white and red children. He has given us a different complexion and different customs. To you He has given the arts. To these He has not opened our eyes. We know these things to be true. *Since He has made so great a difference between us in other things,* why may we not conclude that He has given us a different religion *according to our understanding? * The Great Spirit does right. He knows what is best for his children; we are satisfied. Brother, we do not wish to destroy your religion, or to take it from you. We only want to enjoy our own. Brother, you say you have not come to get our land or our money, but to enlighten our minds. I will now tell you that I have been at your meetings, and saw you collecting money from the meeting. I cannot tell what this money was intended for, but suppose it was for your minister, and if we should conform to your way of thinking, perhaps you may want some from us. Brother,we are told that you have been preaching to the white people in this place. These people are our neighbors. We are acquainted with them. We will wait a little while, and see what effect your preaching has upon them. If we find it does them good, and makes them honest, and less disposed to cheat Indians, we will then consider again what you have said.